There are multiple levels of irony in the Gospel narratives, especially surrounding Jesus’ arrest, trial, crucifixion, and resurrection. One that’s commonly pointed out is that of Jesus’ confrontation with Pilate on the gospel of John. As A.T. Lincoln has shown in his Truth on Trial, we are given a narrative portrayal of Karl Barth’s theme that Christ is the Judge judged in our place. As Jesus, the Truth, the Judge over all the earth, stands face to face with his would-be earthly judges, they end up on trial, rendering judgment upon themselves as they pass judgment on him. In doing so, they send the Judge to the cross to be judged in our place, suffering the judgment of God for their own sins. Again, the dynamic of the Judge judged in our place is plainly here, especially in the reference to the Son of Man drawn from Daniel 7–a scene of judgment and vindication. All the same, the point that struck me was the fact the main prosecutor in the trial was none other than Caiaphas, the High Priest himself. The irony, of course, is that, as the High Priest, his chief job was to serve as a Mediator–the Mediator–for the people of Israel. His chief task was to bringing the sacrifices for the sins of the people before the LORD in the Temple once a year on the Day of Atonement (Lev. 16). His job, you might say, was to be chief intercessor and defense for the people of God, seeking mercy for their sins. Instead, we find him in another role: the accuser, (ha satan). That’s right, for those unaware, Satan’s name comes from the role he plays in the biblical drama–the accuser, the prosecutor of the people of God. And this is the role we find Caiaphas playing on the day of Jesus’ trial, relying on false testimony and trumped up charges in order to convict the Holy One. (This, by the way, is where I clearly get out of my depth as a systematic theology guy.) Still, after the Exile and the return to Israel and the Land, Zechariah receives a vision of the current high priest Joshua in the heavenly council of the LORD, being accused by none other than the Satan. And yet, the LORD rebukes him. He changes Joshua’s filthy garments for new ones, cleansing him of sin, qualifying him to represent the people, and removing the basis of Satan’s accusations. Of course, besides the clear linguistic link (Joshua = Jesus in Hebrew), this screams “type of Christ”, the coming priest who has no filthy garments of his own, being perfectly sinless. On top of this, Joshua is then given a promise of a coming “Branch”, the servant of the LORD, whom some commentators think is a blend of Isaiah’s Servant visions (40-55, cf. esp 53) with Ezekiel, Isaiah, and Jeremiah’s idea of a David-like King to come. So you end up with a vision of a coming priest-king along the lines of Melchizedek. Melchizedek, the priest-king who is the type of Christ to come (Hebrews 7). So right after this scene of the accusation of Joshua comes a dense cluster of images pointing to a coming day when God will remove all the sins of Israel in a single day, through this Branch. Of course, with Christian eyes there a million red lights flashing, begging you to draw connections between it all. Not that I’m suggesting that Matthew intended a clear literary connection, but the theological connections seem like they’re not much of a stretch. 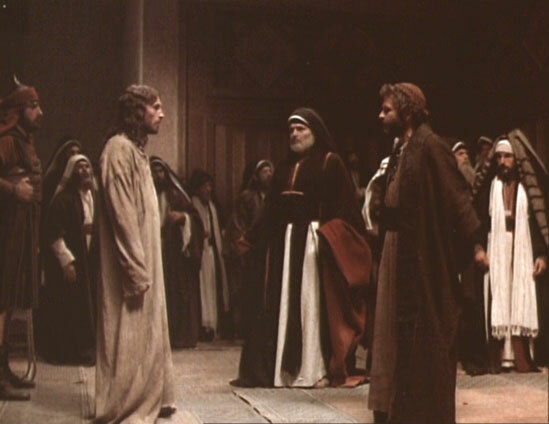 Coming back to the trial of Jesus before Caiaphas, the long and the short of it is that, in the irony of God’s providence, like Satan in the vision of Zechariah, this false High Priest Caiaphas ends up playing the Accuser of Jesus the True High Priest, who is on the dark path he must tread to become the Atoner who goes to remove the sins of the people of God.